As South America’s poorest country, Bolivia is especially dependent upon exporting its natural resources abroad. Over the last ten years, natural gas has become a particularly lucrative, as well as controversial, source of income. While free-market reforms implemented in the mid-1980s have allowed the country’s economy to grow fairly steadily, they have failed to substantially reduce poverty in Bolivia (1). Dissolution with the privatization of natural gas among the Bolivian populace has turned violent on more than one occasion, sometimes even forcing government leaders out of office. The controversy over control of this resource is further complicated by the geographic and social divide in Bolivia. The country’s natural gas fields are concentrated in the wealthier eastern provinces among businessmen with strong ties to the developed world. Bolivians of indigenous descent make up most of the 30 percent in Bolivia who live on less than one dollar per day (2). Such inequality has led to seemingly constant protests over control of Bolivia’s natural gas. If the issue is not soon resolved peacefully, it threatens to drive the country into civil war. Being a landlocked country located amidst the Andes Mountains, Bolivia often suffers from high transport costs and thus benefits most from exporting light, yet valuable, raw materials (3). Given that it has the second largest natural gas reserves in South America, this resource has become a crucial part of Bolivia’s economic prospects (4). Exports of natural gas to Brazil and Argentina alone have risen to around one third of all Bolivian exports, or about $620 million (5). The economic wealth generated by natural gas has not, however, translated into prosperity for the bulk of Bolivians, particularly those of indigenous descent in the western provinces. Furthermore, argument over control of natural gas reserves, which lie in the eastern provinces of Santa Cruz and Tarija, has led to calls for greater autonomy of eastern Bolivia (6). Today, about 55 percent of Bolivians are of indigenous ancestry while almost 15 percent are of Spanish descent. Around 30 percent of the population is a mix of European and Native American blood, or mestizo. The Aymara and Quechua represent the two major native language groups and live mostly in rural areas. Native American culture is also prevalent in the poorer sections of Bolivia's large cities. 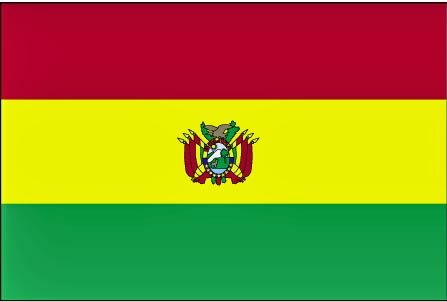 Bolivia's rigid social divide can be traced back to the arrival of Spanish imperial forces in the 16th Century (7). 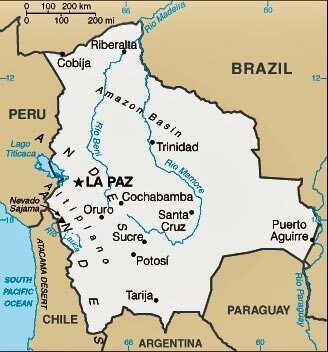 The Spanish established mines south of capital, La Paz, in 1545 to extract minerals such as tin and silver(8). As the Spanish quelled resistance to their operations in Bolivia, they set up a class sytem making the Native Americans the lower class. The artistocracy of Spanish descendents controlled almost all of Bolivia's economic resources and political power until the 1950s. In 1952, a revolution overthrew the old order and implemented democratic, social, and economic reforms. However, control over land and large businesses has mostly remained in the hands of the elite Spanish descendents. Current inequalities can also be traced to the educational system which was set up by Spanish colonists to train only the upper class of immigrants and those of European descent (9). While Bolivia's natural resources have been a source of wealth, they have also exacerbated tensions between the different societal classes. As the National Chamber of Commerce described "'The exploitation of natural resources [has not] led to Bolivia's industrialization, or even to the development of a national middle class'" (10). Opposition groups within the government and Native American citizens of Bolivia have pushed for companies extracting natural resources to invest more in local infrastructure and jobs. Since the mid-1990s, foreign companies have been increasingly extracting from newly discovered natural gas fields making the resource a particularly contentious issue. The poverty of Bolivia combined with the lucrative possibilities of natural gas exporting has made control over the profits conflict-inducing. Companies such as Repsol YPF of Spain and Britain's Pan-American Energy have have introduced plans for a pipeline to export gas directly to California. It is estimated that investments such as this could increase revenue from oil and gas exports from Bolivia to $1 billion (11). The economic, social, and geographic divides surrounding the natural gas issue have caused much civil unrest and political turmoil. After more than 30 people were killed during demonstrations in February 2003, Bolivian President Sanchez de Lozada turned to the military to bring order when protests erupted again in September 2003 over plans to export natural gas through Chile, a country with which Bolivia has had numerous border disputes and even armed conflict. After being forced out of office the next month, Sanchez was succeeded by Vice President Carlos Mesa who faced similar unrest as a result of natural gas export deals. By June 2005, Mesa was subjected to such intense pressure that he was also forced to resign from office. While Bolivia has largely been quiet since Mesa’s departure, the natural gas situation has yet to be resolved and thus continues to be a possible source of violence (12). The intersection of armed conflict and the environment are clear in the case of Bolivia's unrest and its natural gas fields. While they may seem to promise more wealth for a very poor country, the natural gas resources in Bolivia have caused much economic, social and political conflict. The exporting of natural gas by foreign companies has caused profit for some, but dismay for many. It is apparent that the ethnic problems which were already present in Bolivia were exacerbated by the discovery and extraction of natural gas. Civil conflict in Bolivia has caused many lives to be lost because of the battle over natural gas. Discontent began with the privatization of Bolivia's natural gas in the mid-1990s (13). Violent conflict broke out in September of 2003 when 80 people were killed during protests against natural gas exports (14). Bolivia has the second largest reserves of natural gas in South America. The country has proven reserves of 54 trillion cubic feet (15). This resource has been increasingly extracted and exported since the mid-1990s. Bolivia contains high variations in altitude which make for very different habitats relatively close to each other. The Andes Mountains and highland plateau are much drier than northern Bolivia. The Amazon basin of Bolivia’s north represents a more tropical climate with periodically heavy rain (16). 1. Nation A impacts Nation A: Control over natural gas within Bolivia’s borders has caused tension and violence among different segments of the population and the government. The conflict has mainly been between rural indigenous citizens and urban dwellers, with violence involving government crackdown on indigenous protesters. In August of 2004, Gabriel Pinto, leader of the Movement of the Landless (MST) was arrested after being accused of the murder of a rural mayor. The MST soon declared “‘total war against the government. . .not only with our ideas but also with sticks and stones.’” The MST and other groups representing the peasantry have organized massive demonstrations of over 100,000 people to fight what they say is corruption and transnational corporation dominance of their country while at the same time seeking to nationalize Bolivia’s natural gas industry (17). The events shaping the conflict can be seen in Figure 1, above. Beginning with the privatization of natural gas and the increased ability of foreign companies to export the resource, the conflict over who should control Bolivia's natural gas profits has led to many instances of violence and political upheaval. Intrastate tension has increasingly divided Bolivia between eastern and western provinces as each side struggles to gain wealth from natural gas exports. Argument over control of natural gas reserves, which lie in the eastern provinces of Santa Cruz and Tarija, has led to calls for greater autonomy of eastern Bolivia (18). The economic, social, and geographic divides surrounding the natural gas issue have caused much civil unrest and political turmoil. After more than 30 people were killed during demonstrations in February 2003, Bolivian President Sanchez de Lozada turned to the military to bring order when protests erupted again in September 2003 over plans to export natural gas through Chile. After being forced out of office the next month, Sanchez was succeeded by Vice President Carlos Mesa who faced similar unrest as a result of natural gas export deals. By June 2005, Mesa was subjected to such intense pressure that he was also forced to resign from office. While Bolivia has largely been quiet since Mesa’s departure, the natural gas situation has yet to be resolved and thus continues to be a possible source of violence (19). Violence has occurred where protesters have numbered over 100,000 people (20). Government crackdowns have resulted in estimates of up to 80 killed on multiple occasions where the military is used to control the civilian population (21). Therefore, most, if not all, deaths are civilian and it s difficult to get exact numbers. 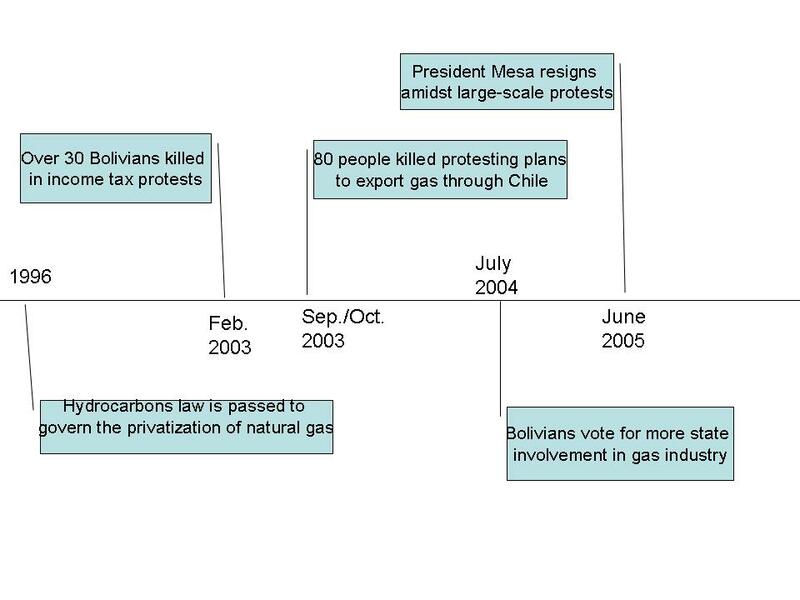 From the diagram, it is easy to see the relationships among several factors in Bolivia's natural gas conflict. The ethnic divides that exist in the country make for a possible foundation of conflict should there be a catalyst such as natural gas profits. Rises in Bolivian GNP, while making part of the population more prosperous, also increase the disparity between rich and poor. As more natural gas is privatized and exported from parts of the country inhabited by a particular ethnic group, violent conflict is more likely to erupt. Such a vicious cycle is what brought down the Bolivian leadership in 2005, throwing the country into turmoil. Conflict has taken place both between the government and citizens, and between different segments of the population. Although multiple presidents have been forced out of office by protesting citizens, Bolivia’s natural gas reserves have still not been fully nationalized as demanded by protesters. Private companies have not relinquished control over their fields as Bolivians wait for a new government to be formed and take action on this issue. (1) “Counter-Reform--or Muddle Along?” The Economist, 15 July 2004; available at http://www.economist.com. (2) “Why is Bolivia in Turmoil?” BBC News, 3 June 2005; available at http://newsvote.bbc.co.uk/mpapps/pagetools/print/news.bbc.co.uk/1/hi/world/americas/4604173.stm. (4) “Timeline: Bolivia.” BBC News, 10 June 2005; available at http://newsvote.bbc.co.uk/mpapps/pagetools/print/news.bbc.co.uk/1/hi/world/americas/country_profiles/1218814.stm. (5) “Pressure Builds Again in Bolivia.” The Economist, 21 April 2005; available at http://www.economist.com. (6) “Corralling the Gas—and Democracy.” The Economist, 9 June 2005; available at http://www.economist.com. (7) "Bolivia." Microsoft Encarta Encyclopedia 2004. (8) "Firms Urged to Help as Bolivia Fights Poverty." BBC News, 7 September 2004; available at http://news.bbc.co.uk/1/hi/business/3611462.stm. (9) "Bolivia." Microsoft Encarta Encyclopedia 2004. (10) "Firms Urged to Help as Bolivia Fights Poverty." (11) "Pipe Dreams." The Economist, 14 March 2002; available at http://www.economist.com. (13) "Pressure Builds Again in Bolivia." (17) Fuentes, Federico. “Bolivia: ‘Gas War’ Movement Resumes.” Green Left Weekly: Online Edition, 1 September 2004; available at http://www.greenleft.org.au/back/2004/596/596p14.htm. (19) “Bolivia Country Report 2005-2006.” Economist Intelligence Unit Database.